If you’ve ever had a Starbucks Cranberry Bliss Bar available only during the holidays – you will appreciate this recipe inspired from those tasty fruity bars. There is a lot of tounge pleasing flavors happening with this cookie. Cranberry. Candied Ginger bits. White Chocolate. Orange Zest. Cream Cheese Frosting! 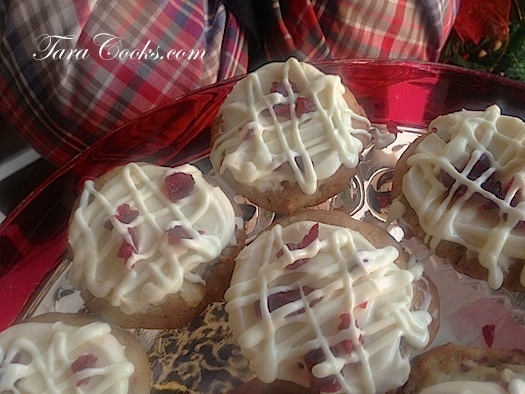 This year I created this recipe to kick off the annual cookie swap here at our house. This is my favorite cookie creation ever! In a large bowl combine butter and shortening and beat with electric mixer until light and fluffy. Add the sugars and cream them with the butter. Add the eggs one at a time and beat after each addition. Add the vanilla and mix well. In a separate bowl, combine the flour, soda and salt. Gradually add flour mixture to butter sugar mixture and beat on medium speed to blend. Add half of the white chocolate pieces and 1 1/2 cups of the chopped cranberries to the mixture and combine. Add the candied ginger and mix well. Use a 1 oz cookie scoop to drop cookies 2″ apart on a greased cookie sheet. Bake in a preheated 375 degree oven for 9-11 minutes. Remove cookies from oven and transfer to a cooling rack. While cookies are baking, whip the cream cheese until light and fluffy. Gradually add the powdered sugar and mix with electric mixer. Add the orange juice (or cream or half and half) a Tablespoon at a time to the powdered sugar mixture until desired spreading consistency is acheived. Add the vanilla and orange zest. Spread cooled cookies with icing. Sprinkle remaining chopped Craisins on top of icing. Melt some white chocolate pieces and drizzle over iced cookies, first in horizontal line patterns, then in verticle line patterns. Allow drizzle to harden before moving cookies to a party tray or airtight container.